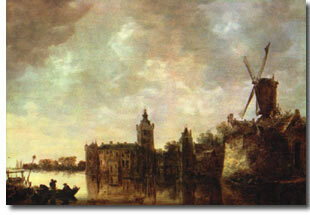 Jan van Goyen (1596-1656) was the first to choose landscape art for itself alone. He was born in Leyden, where he received his first instructions from, the talented burgomaster Izaak Klaasz van Swanenburgh, whose son was to teach Rembrandt the first rudiments of his profession. After a visit to France in 1615 he completed his years of pupilage under Esaias van de Velde at Haarlem. While his stay there was of short duration its effect was not transient, for after returning to Leyden, he painted for some time in his master's finicky manner. He chose, more than Cuyp or van de Velde, to portray with truthful fidelity the picturesque scenery of land and stream, and trees and cabins, although he never could quite sever himself from the pleasure of allowing animals and figures to play an important role. Gradually he became broader and freer in his treatment, and liberated himself from the conventional manner to adopt one thoroughly his own. This evolution was manifested chiefly in the gradual subordination of colour to tone. He kept himself to a brown or gray key, with tones between, sometimes leaning towards a reddish warm-yellow, then again, towards a bleached-yellow, gray-green, or bluish gray. Although this peculiar, individual refinement leaves him open to the charge of mannerism, it yet invests his works with a special charm. Whether in more or less placid marines, where tall craft float lazily on the water, or in quiet riverside perspectives, or in quaint village views, or in large stretches of flat country, or in undulations of the gray dunes, no heavy dark, no bright colour disturbs the monotone. In his division of light he affected to use a dark spot in the foreground, a boat or piece of land or a shade, to push even farther back the lighter background and the horizon; a manner which afterwards was frequently followed by other landscapists, and only discarded by Rembrandt as unnecessary. Van Goyen remained for several years at Leyden, where Jan Steen became his pupil and son-in­law, afterwards he went to The Hague, where the luxurious court of Frederik Hendrik offered him an abundant outlet for his prolific energy. While there he greatly influenced Sybrand van Beest (1610-1674), of whom nothing is known.